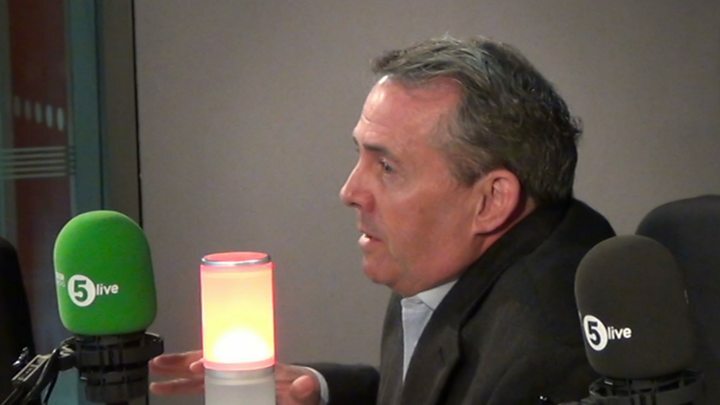 Media captionLiam Fox MP is willing to ask questions in the Commons about Longworth suspension. Liam Fox has demanded an explanation from the government after the British Chambers of Commerce suspended its boss for remarks about the EU referendum. The Tory former defence secretary said ministers must clarify "if they were involved in any way in putting pressure on" the BCC to suspend John Longworth. He told the BBC he was ready to pursue the matter in parliament if it was not properly explained. Mr Longworth had said the UK's future could be "brighter" outside the EU. He said his comments had been made in a personal capacity. The BCC told its members Mr Longworth had breached the group's official position of neutrality on the referendum. Earlier, Boris Johnson called Mr Longworth's treatment "scandalous". Number 10 has denied putting pressure on the BCC to suspend him. The London mayor and Mr Fox, both campaigning for Britain to leave the EU, said the BCC director general had been a victim of "Project Fear" - a term used to accuse the Remain campaign of using scare tactics about possible repercussions of leaving the EU. British voters will be asked on 23 June whether the UK should remain a member of the EU. The BCC, which represents thousands of large, medium and small businesses, has said it will not campaign for either side in the referendum as its membership is split. Last month, an online poll of its members found that 59.5% of more than 2,000 who responded preferred to remain in the EU and 30% said they would vote to leave. Mr Fox told BBC Radio 5 Live's Pienaar's Politics: "There needs to be quick clarification about all this from the government, if they were involved [in Mr Longworth's suspension] in any way. "And then I think we'll wait and see. We've got a number of mechanisms open to members of parliament to get to the bottom... Written questions and asking for statements, and I'll want to do that. "I want to know if any part of government, not just number 10, was involved in putting pressure on the BCC to drop John Longworth, because I think that is inappropriate and if we don't get a good enough explanation we'll have to get a better one on the floor of the House of Commons." Media captionBoris Johnson says Mr Longworth was expressing a "passionate, optimistic view"
In a statement on Saturday evening, Mr Johnson said it was "absolutely scandalous that John Longworth has been forced to step aside". "This is a man who reached the conclusion - after long reflection and a lifetime's experience of business - that it would be better to Vote Leave. "He speaks for the many small and medium sized businesses - the lifeblood of the economy - who cannot understand why they should comply with more and more regulation, over which this country has no democratic control." Many of those working to leave the European Union present themselves as campaigners at odds with an overbearing establishment. They will now ask whether anyone at Downing Street had any contact with the BCC before Mr Longworth's suspension, a question Number 10 sources have not yet been able to answer. Any proof that Mr Longworth had been silenced by powerful enemies would strengthen that narrative. For now, no proof has been presented, and Mr Longworth - who has not commented - finds himself at the centre of an increasingly ill-tempered row. Although he stressed that he was expressing a personal opinion, Mr Longworth said in a speech to the BCC's annual conference that the very best place for the UK to be was in a reformed EU. But he added: "I have come to the conclusion that the EU is incapable of meaningful reform, at least in the foreseeable future." A Downing Street source told the BBC Number 10 was as surprised by the news that Mr Longworth had been suspended as anyone, and strenuously denied any suggestion it had put pressure on the body. "This is simply not true. This is a matter for the BCC. No pressure was put on the BCC to suspend John Longworth," the source said. A source for the campaign group Britain Stronger In Europe told the BBC allegations from pro-Leave campaigners that it was using scare tactics were a smokescreen to avoid answering difficult questions. Image caption John Longworth, head of the British Chambers of Commerce, described the EU referendum as a choice between the "devil and the deep blue sea"